The Castro Valley was one of the venues for the Corita Celebration, February and March of this year. In partnership with Hayward Arts Council and Art Inc, we showed the award winning documentary film, Primary Colors: the Story of Corita, hosted a gallery show and lobby case display of her works. 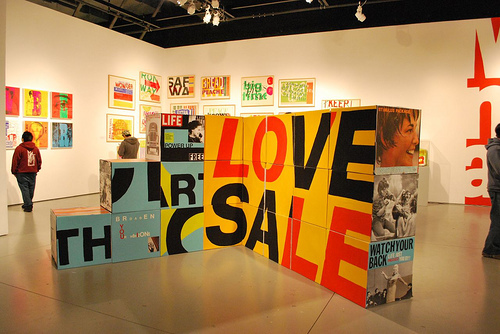 Corita Kent, also known as Sister Corita, gained international fame for her vibrant serigraphs (silk screens) during the 1960s and 1970s. A Sister of the Immaculate Heart of Mary, she ran the Art Department at Immaculate Heart College until 1968. Corita’s art reflects her spirituality, her commitment to social justice, her hope for peace, and her delight in the world around us. She was born Frances Kent in 1918 in Fort Dodge, Iowa, grew up in Los Angeles and joined the Order of the Immaculate Heart of Mary in 1936, taking the name Sister Mary Corita. She graduated from Immaculate Heart College in 1941 and then taught grade school to Native North American children in British Columbia where she was inspired by their vivid art and imagery. In 1946 she returned to teach art at Immaculate Heart College . In 1951, she received a master’s degree in art history from the University of Southern California; it is also the year she exhibited her first silkscreen print. Corita’s earliest works borrowed phrases and depicted images from the Bible, but the early 1960’s, she was using popular culture (such as song lyrics and advertising slogans) as raw material for her meaning-filled bursts of text and color. One story told is that she took early inspiration from a bold billboard advertising a Los Angeles car wash. Corita’s cries for peace in the era of Vietnam were not always welcome. In 1965 her “Peace on Earth” Christmas exhibit in IBM’s New York show room was seen as too subversive and Corita had to amend it. She left the order in 1968 for personal reasons during a time of change in the Catholic Church after the Second Vatican Council. She continued to create bold serigraphs, helping to establish it as a fine art process. Her work is in private collections and museums around the world including the Metropolitan Museum of Modern Art in New York. Her “Love” stamp issued in 1985 sold 700,000,000. It remains one of the top selling stamps of all time. The Rainbow Swash, a painted water tower just outside Boston is the largest piece of copyrighted art in the world. She lived and worked in Boston the rest of her life. She died of cancer in 1986. The Castro Valley Library exhibit has closed but her work may still be seen at Galleria at the Hayward City Hall.